I first found Ann Wood a few years ago while flipping through the wonderful pages of, the now out of print, Mary Engelbreil's Home Companion. I was drawn into her story by the beautifully detailed photographs of her birds and now check out her blog pretty regularly. Last week she decided too bless her fans and followers with an epic tutorial on how to create one of her amazing paper mache boats! I am picking up the last of the supplies that I didn't already have this week, and am going to have some fun with the kiddos, making these boats to hang in the play room. I hope some of you become a fan of Ann Wood and spend a little time making one of these awesome boats with your little one(s). Hi! 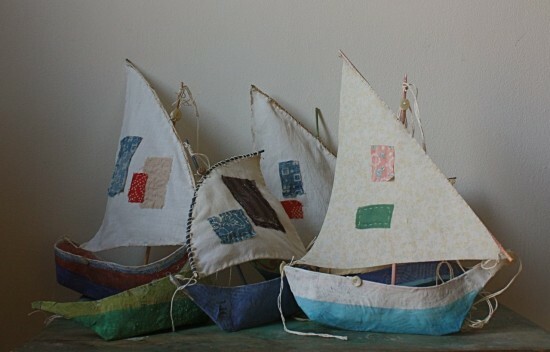 Those boats are so cute and look like a lot of fun to make! I think I might have to try it :) Have fun with your project! Let me know if you do ~ be sure to share a picture! Ann Wood is amazing and after being in awe of her work for so many years, to now get her blessing to go ahead and make our own Ann Wood inspired crafts is so excited. : ) Seems like a wonderful project to do with a child, so many lessons can be learned from this simple idea. i was so obsessed with mary englebreit as a young girl! i was pretty much a 12 years going on 40, haha. whatever is she doing these days i wonder? And, have fun making boats with your children! Mr. Ted Edinger ~ Thank you so much for your kind comments! I haven't made a turtle just yet, but you're not the first to ask. I might have to give a try. I'll be sure to let you know. SaraL ~ I think these would be the perfect school projects. How cool would it be to see a room full of these hanging from the ceiling. Perfect, as spring and summer months will be here before we know it.